My cat, Mr. Sulu, and "the Most Interesting Cat in the World"
To recap - one day a few years ago, I noticed my cat Scout sitting in a funny pose. 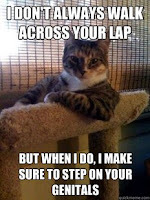 She was sitting in her usual place, on a piece of cat furniture in front of our window, but her elbow was hanging over the edge, like a truck driver with the window rolled down on a summer day. I took her picture with my phone and laughed about it with friends for a few weeks. A while later, I discovered the site fupenguin.com, and submitted the photo on a whim. Much to my surprise, Scout showed up a short while later. I was thrilled, and assumed that would be the end of it. It wasn't. Every few months, we'd find the picture somewhere unexpected. Someone would use it in a poster for a party or something else small like that. Then in May 2011, Scout's photo appeared on quickmeme.com. QuickMeme is a site that lets you add captions to photos, and people vote on their favorites. Someone must have thought Scout looked like "The Most Interesting Man in the World" from the Dos Equis commercials, since the captions were all parodies of his catch phrase, "I don't always drink beer, but when I do, I drink Dos Equis." The QuickMeme page really took off when it was linked from Reddit Pics, and was popular enough to stay on their front-page for over a day. As of November 2011, almost ten thousand people (9601) have given that photo a positive "up" vote. 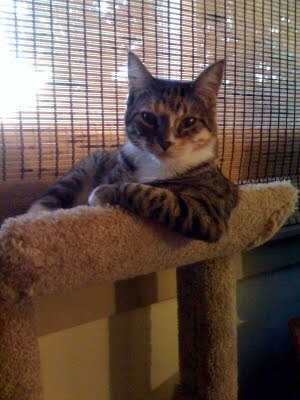 Even today, months later, Scout's QuickMeme page is still the #1 result on Google if you search for "the most interesting cat in the world". The latest development came a few days ago (Thursday, November 3, 2011), when George Takei posted the image of Scout on his Facebook page. George "Mr. Sulu" Takei. Holy crap. Scout has no idea. George liked the caption, "I don't usually want to cuddle, but when I do, you're wearing all black and about to leave for work." So far, in just a few days, over 4600 people have clicked the "Like" button for that post, and there are over 300 comments in the thread. Over 2800 other people have now shared that link on their own Facebook feed.